Neutrogena Rapid Wrinkle Repair Cream is a very strong retinol cream and works well to help with fine lines and wrinkles. The texture of this retinol cream is thick and silky in texture, and it feels really nice on the skin. When I first applied it, I didn’t know if it would be too think. But, it ended up thinning out as it’s rubbed into the skin and absorbs really nice. Even though this cream is pretty thick, it doesn’t require that much product to cover the entire face and neck. One thing I’m not a big fan of though is the packaging, the cream comes in a jar which I find unsanitary. The smell of this product is also way too strong for my liking. When I first opened the jar and smelled it I really liked the floral smell, but when I applied it to my face, the scent was too intense and never died down. I didn’t really notice much of a difference in my skin after using it for a short period of time. My skin did feel a bit dry but nothing out of the ordinary, and I didn’t notice any plumping of the skin yet. After using this product for a while, I noticed that it really was helping to plump my fine lines and wrinkles. I was noticing specifically on the areas I have deeper wrinkles that it was making a big difference. Although it did make a nice difference on my fine lines and wrinkles, I will say this retinol is very strong. It made my skin flake and peel much more than I’m used to. 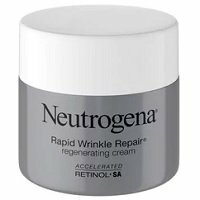 Overall, Neutrogena Rapid Wrinkle Repair Cream is a good cream for anti-aging and targeting fine lines and wrinkles on the face, but will definitely leave the skin dry and flaky. Neutrogena Rapid Wrinkles Repair Cream feels like a silky soft cream that has a thick texture but spreads evenly on the skin without having to use tons of product. When I first applied this product onto my skin, I wasn’t sure about the texture. But as I rubbed it into my skin, it felt super soft and luxurious. Neutrogena Rapid Wrinkle Repair Cream applies very easily, and despite the thick texture of the cream, a little bit actually goes a long way. I only had to do a few dabs of cream on my face and one on my neck. The cream also absorbs super easily into the skin and leaves the skin feeling hydrated and smooth. Neutrogena Rapid Wrinkle Repair Cream dries really fast for how thick it is; it dries in about 15 seconds. Once the cream dries, it totally absorbs into the skin and leaves no residue or stickiness which I like a lot. I thought I liked the smell of Neutrogena Rapid Wrinkle Repair Cream at first because it has a nice floral smell, but it’s actually way too strong for my liking. The smell stays on your face all night and it kind of gave me a headache after a while. Short term, I didn’t really notice any difference in my face. If anything, my face felt a little bit more dry than normal. But other than that, there were no differences. After a longer period of time, Neutrogena Rapid Wrinkle Repair Cream definitely made a difference in the fine lines and wrinkles on my face. I noticed that the wrinkles on my forehead had lessened and I was no longer seeing the lines around my mouth. The only downside is that this product really made my face dry and peel; it’s definitely a strong retinol product! Neutrogena Rapid Wrinkle Repair Cream has a bunch of interesting ingredients including retinol SA, glucose complex, and hyaluronic acid. Retinol SA is designed to work faster than normal retinols and helps to rejuvenate the skin throughout the day. Glucose complex works in conjunction with retinol SA to boost the acceleration of the resurfacing of the skin. It’s supposed to help plump fine lines and wrinkles. Hyaluronic acid is supposed to help get rid of fines lines and wrinkles by locking moisture into the skin and helping to plump up the skin and help preventing further aging. These three ingredients together are what Neutrogena calls an accelerated retinol SA and are supposed to help with aging of the skin at an accelerated rate. The cost of Neutrogena Rapid Wrinkle Repair Cream is $27.99 for 1.7 oz which comes out to $13.99 per oz. Neutrogena Rapid Wrinkle Repair Cream has a 30 day money back guarantee. To buy Neutrogena Rapid Wrinkle Repair Cream, click here. Ingredients Retinol SA is an ingredient to help with accelerated resurfacing of the skin.